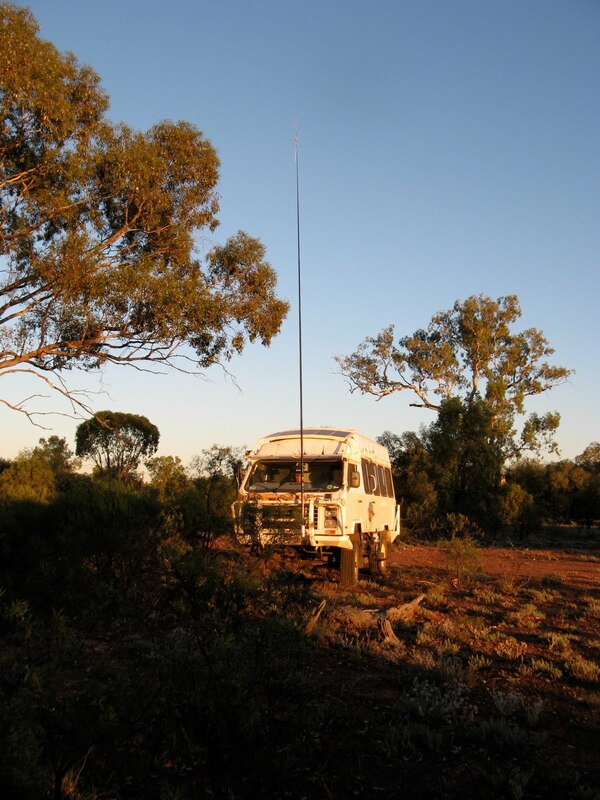 We use the VKS737 HF radio network to keep in contact with the world while we are camped in remote locations. We normally used a fairly short (2m) tapped whip antenna, which is quite convenient and works reasonably in most places, but we recently installed an alternative 9m fibreglass whip antenna. It take a little longer to erect but at a 1/4 wavelength, it's the optimum length for using Channel 2 on 8022 KHz and provides the best possible communications on this frequency. Using this antenna we invariable receive a 5 by 5 report (the highest) from VKS bases when requesting a radio check. I've also determined that it can be used as quite an acceptable shortwave antenna for receiving ABC and BBC broadcasts (amongst many others) over a broad range of frequencies from 6 to 10 MHz, although with some loss of efficiency either side of 8 MHz. 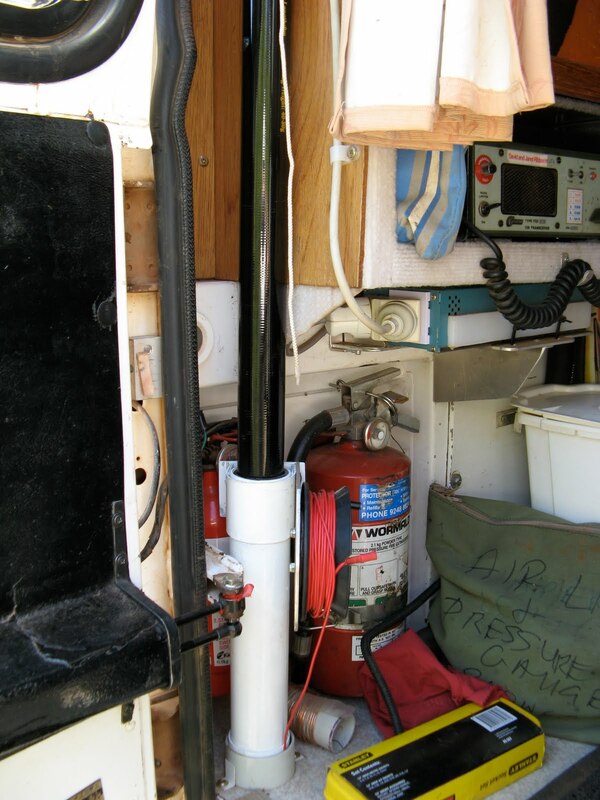 The antenna is based on a 9m, 9 section, telescopic fibreglass fishing pole, but with a wire inserted up the middle. 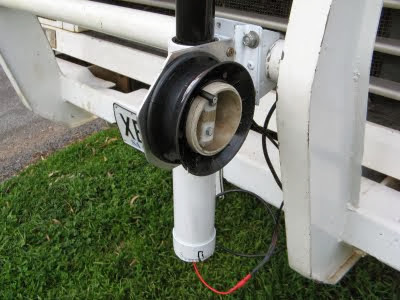 They are called SuperRod Antennas and I got mine from The Electric Bug in Adelaide without any mounting hardware, but a cheaper alternative could be to make one using a fishing pole from angling shops. (See here where you can buy 9m bare poles for around $40 plus freight, and fit the wire yourself, see here for some assembly ideas. For use on 8022 KHz, none of the loading coils are necessary). If you are really keen you can import a much tougher pole from Spiderbeam in Germany. They are not that expensive at Euro 66 (AUD 100) plus freight for a 12m pole. The wire doesn't have to run up inside the antenna, it will work just as well if the wire is wrapped around the pole, or if it is just attached to the tip and the pole used as means of getting it vertically into the air. It just looks neater inside. The pole doesn't even have to be 9m long either, only the wire has to be that long. Mounting: It needs a sturdy mounting point on the bull bar or similar because, although it's not heavy, as it moves around in the breeze it places a considerable strain on its mount. It should not be used on a moving vehicle while raised. In this mode the antenna is acting as one half of a vertical dipole with the vehicle and ground beneath it providing the other half. Antenna Wire: When collapsed, the 9m of wire needs to be coiled or wound up to keep it straight and tidy. A kinked wire won't run up or down the antenna smoothly. Erecting: (Important: first read the Power Line warning at point 7 below. Note this sobering story from the ABC). The sections must be extended tightly and "screwed" into each other as the antenna is being erected, or they can slide down inside each other, either during operation as the wind blows or as you are lowering the antenna, trapping the wire and loosing their telescopic sequence. Lowering: The wire must be pulled gently and continuously out of the bottom of the antenna as each section is separated, or it will get trapped and kinked in the bottom section which is frustrating to unravel and the wire can break. Connecting: The antenna needs connections made to the radio lead. It doesn't just plug on. Frequencies: It primarily intended for Channel 2 (8022 KHz) and needs some mods to work on Channel 1 (5455 KHz) or RFDS frequencies. Power Lines and Lightning: It's so tall it's a power-line and/or lightning risk. I have experienced all of the above problems and modified the antenna and mounting arrangements to minimise them. To mount the antenna, I fitted a length of 50mm PVC pipe (which holds the lower section of the antenna), to an aluminium frame which then slides into a holder, made from aluminium rope track, mounted on the bullbar using 50mm U-bolts. I could have mounted it higher where it might work better but I couldn't then raise it, since the top would be beyond my reach. The PVC pipe has a cap on the bottom to hold the antenna but with a hole in it for the wire to slide through. The whole assembly can be removed, with the wire wound up on an attached reel, for storage inside the Oka. The mounting using aluminium rope track on the bullbar. The SuperRod stored safely in the Oka. After lowering the antenna and extracting the wire, you are left with a 9m tangle of wire on the ground (actually only 8m since 1m is always inside the antenna). To tidy this up I fitted a cheap hand fishing reel to an aluminium plate with a simple handle to wind up the wire as it is being pulled out, which is a lot easier with 2 people. A notch/slot in the reel holds the connector in place as the wire is wound up. 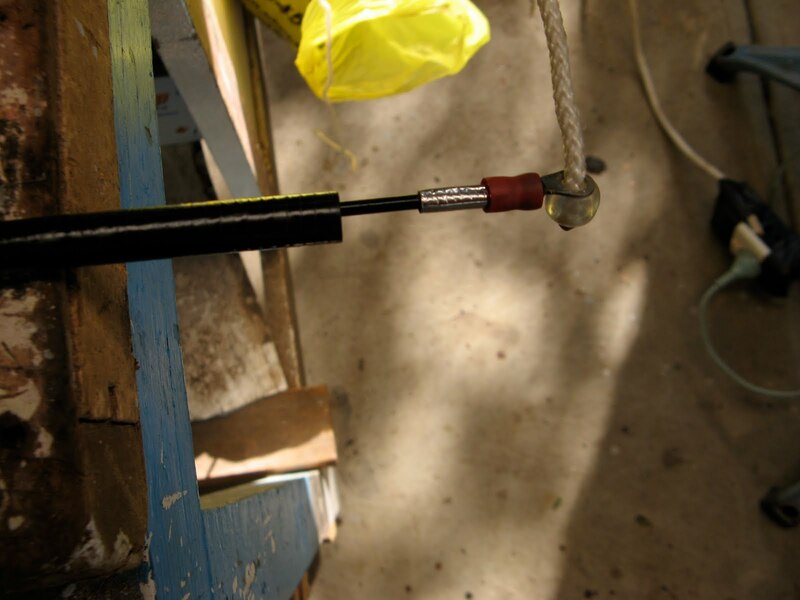 The SuperRod mounted on the bullbar, with a hand fishing reel for winding up the wire. The SuperRod lowered and the wire neatly wound up on the hand reel. You could also wind it around any other kind of former, such as those designed to tidy up extension cables, but it is essential that the wire is not bent too sharply or kinked in the process, or erection and lowering of the antenna will be made more difficult. The smaller sections can drop down inside the larger ones and get jammed, also trapping the wire inside. This will require a complete disassembly of the antenna to disentangle. A simple solution is to fit a nylon string to the tip of the smallest section and to tie a ping-pong ball or similar sized plastic object (I use the top off a deodorant can) about 50cm from the tip. Then, none of the smaller sections can disappear very far inside the larger ones, and you can pull them out using the nylon string. A bead to hold the nylon string in place. The wire jammed and broke (actually it pulled out of the top section) while I was experimenting with erecting the antenna. 9m of antenna is a bit of a handful to hold and I must have pulled too hard on the wire, and you certainly don't want this to happen in a remote location. So I disassembled all 9 sections to get at the top section. 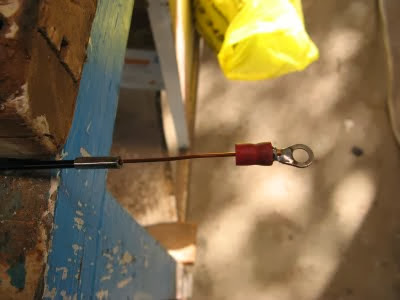 The red insulated wire as supplied is joined to a fairly thin solid copper wire part way up the thinnest section, since the red wire is too thick to go through the centre hole in the fibreglass. The solid wire is pushed through the tip of the section and presumably glued or crimped in place, but not very securely. This is what failed so I discarded the thin copper wire. To improve this aspect I drilled a 1mm hole down the tip of the section, just deeper than the crimping band, and securely soldered a 50cm piece of thicker copper wire to the red insulated wire. Then I inserted it through the top section until it protruded from the tip. I soldered a round terminal to the wire sticking out of the end, to prevent it ever slipping inside the rod again. Bending a 6mm loop in the wire would work as well and either method will also provide a means of attaching a nylon string to the top section. A small bead was used to secure the string to the terminal so it all still nests together neatly. A bigger object was then attached to the string as mentioned above, to prevent any of the sections from sliding too far in. A terminal soldered to a thicker copper centre wire after drilling a 1mm hole in the tip. In retrospect, I found disassembly of the antenna and replacing the wire to be a very useful exercise because I now know how to replace the wire if it ever breaks again while travelling. A PL259 socket (or whatever connector you need to match the one on your antenna lead) needs to be mounted near the bottom of the antenna for connecting the coax cable from the radio. You might need to extend the radio antenna lead if it no longer reaches the new bullbar mount. The centre connection of the socket can be fitted with a short wire with a male bullet connector crimped on, to connect to female bullet connector on the antenna wire. The ground (outer) section of the connector needs to be connected to the chassis of the vehicle using a ground cable which is as short as possible. The bull bar frame might be OK as long as that itself is well grounded to the vehicle chassis. Fit a ground cable from the socket to the vehicle chassis just in case. You can tell how effective the grounding is buy turning on the radio, with the antenna erected and connected, and listening to the level of background noise received. It will change in volume as the grounding is improved or made worse. Maximum noise volume (ie best match with the radio) indicates the improved grounding. This doesn't take the place of proper antenna tuning and matching tests but unlike tapped whip antenna bases, the SuperRod has no matching components, only a centre wire, so some experimenting is necessary. With a tapped whip antenna mounted as well as the SuperRod, I was able to switch the radio lead from one to the other and confirmed that the SuperRod certainly had better reception (higher signal strength) on 8022 KHz than the tapped whip. As to be expected, it also received background noise better as well. In high noise environments, such as at home in a more dense housing area I’ve found the antenna works well with much less electrical noise pick up when still connected but mounted horizontally from the bullbar and supported on something non-conductive, eg a dry tree branch but I usually rest it on a wheelie bin. It will sag a bit and is more directional this way but it certainly increases the signal to noise ratio. In this mode the antenna is now acting as one half of a horizontal dipole but with the vehicle simulating the other half. The 9m SuperRod can also be used directly on VKS737 Channel 1 on 5455 KHz, with some loss of performance since it's not matched to the transmission frequency. It really should be 13.75m long to be a 1/4 wavelength at that frequency. 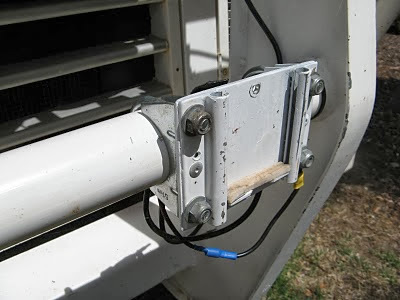 Channel 1 performance can be improved by fitting a loading coil so it looks to the radio as if it were a 13.75m antenna, but they cost around $40-50 commercially, but one could be wound much more economically. I found that a simpler solution was to attach about 4.5m of additional wire between the radio antenna lead centre wire and the SuperRod wire connection and to droop this loosely over a nearby bush/tree branch. It will work better there than just lying on the ground, but keep people away from the wire when transmitting to avoid radiation burns. This is not as good as a tuned loading coil but is adequate as a fallback. The wire I use is the type sold in hardware stores for use with low voltage garden lighting systems. I has a 10 amp current carrying capacity and nice thick insulation since it's intended for outdoor applications, so it's ideal for laying on the ground or throwing up trees. It's usually twin conductor but is easily split into single conductors. A better but more tricky alternative is to connect the extra wire to the top of the antenna, using the solder terminal fitted at the tip, and to extend that wire out sideways and/or upwards as far as possible, using a piece of nylon string attached to the end and fixed to a tree/bush etc. It will now be the correct length and nice and high, although the antenna will bend a fair bit and its radiation pattern won't be optimum. Note that similar bent antennae, called Near Vertical Incidence Skywave (NVIS) systems, are available from Codan, Barrett etc, as in the sketch on page 2 of the Codan brochure here. This system optimises the skywave signal path for short range communications (inside the normal skip distance) by directing some of the transmitted energy upwards at an angle, rather than horizontally, which reflects off the ionosphere to closer destinations. The Royal Flying Doctor Service (RFDS) uses frequencies in the 5 MHz range (5145, 5110, 5300, 5360, 5410 KHz depending on location of their bases) which are similar enough to the VKS737 Channel 1 frequency of 5455 KHz that the SuperRod with the additional 4.5m of wire should be capable of using them effectively. Some tuning of the exact length could be done as required using the formula (300/Frq MHz)/4. For Frq=5.3 MHz (5300 KHz), for example, an additional wire length of 4.8m would required. See the RFDS frequency and VKS737 SelCall usage on this VKS737 document. Note that Selcall access to the RFDS via an HF Radio (with VKS737 Selcall capabilities) is now the preferred and most reliable method of contacting the RFDS. Their radio frequencies may not be continuously monitored. The SuperRod could readily be used on frequencies higher than 8mHz (ie a shorter antenna for 10, 12, or 15 mHz) by cutting the wire inside to the appropriate length and only raising the antenna sufficiently to elevate that length of wire. Of course, to use it for several frequencies would mean having small connectors part way along the wire sufficiently small to fit inside the telescopic section (or abandon the inside wire in favour of a spiral wound external wire). Be very aware of overhead power lines, see this recent sobering story. 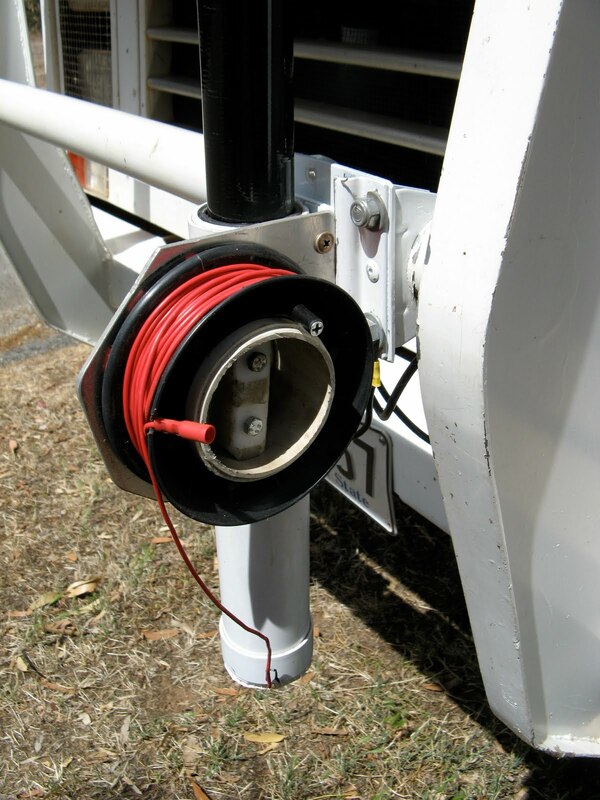 Before raising a SuperRod, first look upwards to ensure there are no power-lines within range (which maybe only 6 m above ground level and well within the reach of a 9 m antenna), especially in populated areas such as caravan parks, national park camping areas, roadside rest areas or boat ramps. It's too easy to just raise the antenna, section by section from bullbar level, without first checking upwards. You could get a very nasty (and fatal) surprise, and in any case, your radio won't work very well in the proximity (~100m) of power lines due to the noise induced from the power transmission. Transmitting probably won't be affected but reception certainly will. A tall antenna such as the 9m SuperRod will also be very attractive to lightning, so be very careful about using it when there are thunderstorms about. In particular, don't rely on lightning protection devices and don't leave it up at night if there is the slightest chance of strong winds or thunderstorms springing up unannounced. Remember, in a thunderstorm you don't want to be the tallest thing around. The WANSARC radio club has a useful review of the SuperRod on page 5 of this issue.